The Giant Hogweed (Heracleum mantegazzianum) – also know as Giant Cow-parsnip – is a member of the parsley or carrot family, Apiaceae (Umbelliferae). As its name indicates it is characterized by its size and may grow to 15 to 20 feet in height. Except for size, it closely resembles cow parsnip, Heracleum lanatum, a plant native to Washington and BC. It is further distinguished by a stout dark reddish-purple stem and spotted leaf stalks. Stalks and stem produce sturdy pustulate bristles. The stem and stalks are hollow. Stems vary 2 to 4 inches in diameter. The compound leaves of giant hogweed may expand to five feet in breadth. Each leaflet is deeply incised. Giant hogweed is a perennial with tuberous root stalks which form perennating buds each year. 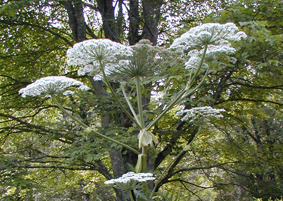 The inflorescence is a broad flat-topped umbel composed of many small white florets. Each inflorescence may attain a diameter of 2-1/2 feet. The florets produce large elliptic dry fruits marked with brown swollen resin canals up to 1 mm in diameter. Giant hogweed has been introduced to Europe, the United Kingdom, Canada and the United States as a garden curiosity from southwestern Asia. Because of its tenacious and invasive nature it soon becomes a pest within the ornamental garden and readily escapes. It has naturalized in many of the places where it was first introduced. Growing along streams in Ontario, on Vancouver Island, and in Great Britain it forms a dense canopy outcompeting native riparian species resulting in an increase in soil erosion along the stream banks where it occurs. The plant exudes a clear watery sap which sensitizes the skin to ultraviolet radiation. This can result in severe burns to the affected areas resulting in severe blistering and painful dermatitis. These blisters can develop into purplish or blackened scars. Proliferating populations in urban and suburban areas represents an increasing public health hazard. Giant hogweed may colonize a wide variety of habitats but is most common along roadsides, other rights-of-way, vacant lots, streams and rivers. Because giant hogweed often grows in wet areas, we are considering it to be an invasive freshwater weed. Plants may be dug-out, but care should be taken to remove much of the root stalk. This can be difficult and unpleasant. Always wear protective clothing and avoid getting the sap on your skin. Mowing serves only to stimulate budding on the perennating root stalk, but might be successful if done consistently and persistently enough to starve the rootstalk. Cattle and pigs are cited as possible biocontrol agents. Both eat giant hogweed without apparent harm. Trampling also damages the plant. Whether any formal investigation for phytophagous insects in giant hogweed’s native range has been conducted is unknown. Scotch Broom (Cystisus scoparius) is an unarmed spindly deciduous shrub of the pea family, growing to 3m tall with typically yellow pea-like flowers and a sweet fragrance. It produces black 5cm long seed pods with seeds that remain viable for up to 40 years in the soil, making this weed very difficult to control once it spreads into an area. Scotch Broom Grows in dry, open and disturbed sites. It is widely abundant on roadsides and power lines throughout southern coastal BC. It’s range is still expanding in our region. All new plants seen establishing an area should be disposed of immediately. Within a Garry Oak ecosystem, cutting is preferable to pulling since less damage is done to the soil surface. Large plants should be cut down before they go to seed; pruning shears, or sometimes a small saw, will be necessary. As with many plant species cutting should be undertaken during the dry summer months, after the plants have put their energy into flowering and while the seed pods are still green. Repeat removals from the same site in subsequent years will be necessary as the seeds remain viable for long periods of time. Eventually native vegetation will grow up, this should be encouraged by planting native species that would have grown in the area originally before the land was cleared. Other alternatives include introducing a beetle species that feeds exclusively on the broom seeds. This is currently being experimented with in Washington State. Himalayan Blackberry (Rubus discolor) is a perennial import from Eurasia and is an aggressive exotic which rapidly overtops the understory vegetation in riparian habitats, and spreads by extending long runners which root at the ends. A colony of blackberry can widen by 10 ft. or more a year, smothering every plant in its path. Huge areas of diverse riparian shrubs and forbs have been turned into low productive monocultures by this uninvited plant. The thorns of this species are large, woody arcs, like rose thorns, which draw blood easily. The leaves are in groups of three to five leaflets (usually five), and are much lighter in color on the underside than on top. Flowers are white to pinkish in color with petals 3/8 to 5/8 inch (10 to 15 mm) in length. Berries are blackberry-like, oblong and black in color. The canes are 5-angled, making large, stiff arches which can reach 10 ft. or more in height before bending over and traveling outward toward a new place to put down roots. This introduced invasive shrub has become widely naturalized, often competing with native shrubs such as the salmonberry, thimbleberry, wild raspberries and others. This weed is very difficult to remove as it has very tough roots that are difficult to remove. While it is a noxious weed, much of our wildlife has adapted to feed on the blackberries as a food source. The problem is however that the blackberry reduces biodiversity due to competition and this results in a less varied and therefore less nutritious diet for our native wildlife. Do not allow this weed to grow in your yard; where you see a small plant getting established destroy it and prevent it from becoming a permanent resident. The plant must be removed by the roots, and care must be taken to get all runners that have also rooted. Information Pages – Use the links to learn more about botany and the vegetation and flora of British Columbia. E-Flora’s Atlas Pages – The E-Flora atlas pages provide detailed information on British Columbia’s plant species. Photo Gallery – More that 10,000 photos of vascular plants, mosses, liverworts, lichens, fungi and algae can be found in the E-Flora Photo Gallery. Check out the E-Flora BC website. Invasive species are a part of the flora of British Columbia. They are alien species that have become abundant and widespread in the landscape to such a degree that they replace or swamp the natural species assembly in an ecosystem, and cause havoc with ecosystem function. Report a Weed is a feature of the BC Ministry of Forests and Range Invasive Alien Plant Program aimed at reporting new occurrences of invasive plant species. Check out the E-Flora BC Invasive Plant Species webpage.